A parfor-loop in MATLAB® executes a series of statements in the loop body in parallel. 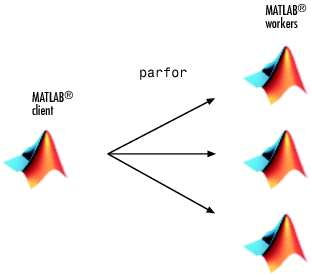 The MATLAB client issues the parfor command and coordinates with MATLAB workers to execute the loop iterations in parallel on the workers in a parallel pool. The client sends the necessary data on which parfor operates to workers, where most of the computation is executed. The results are sent back to the client and assembled. A parfor-loop can provide significantly better performance than its analogous for-loop, because several MATLAB workers can compute simultaneously on the same loop. Each execution of the body of a parfor-loop is an iteration. MATLAB workers evaluate iterations in no particular order and independently of each other. Because each iteration is independent, there is no guarantee that the iterations are synchronized in any way, nor is there any need for this. If the number of workers is equal to the number of loop iterations, each worker performs one iteration of the loop. If there are more iterations than workers, some workers perform more than one loop iteration; in this case, a worker might receive multiple iterations at once to reduce communication time. Some loop iterations that take a long time to execute. In this case, the workers can execute the long iterations simultaneously. Make sure that the number of iterations exceeds the number of workers. Otherwise, you will not use all workers available. Many loop iterations of a simple calculation, such as a Monte Carlo simulation or a parameter sweep. parfor divides the loop iterations into groups so that each worker executes some portion of the total number of iterations. Code that has vectorized out the for-loops. Generally, if you want to make code run faster, first try to vectorize it. For details how to do this, see Vectorization (MATLAB). Vectorizing code allows you to benefit from the built-in parallelism provided by the multithreaded nature of many of the underlying MATLAB libraries. However, if you have vectorized code and you have access only to local workers, then parfor-loops may run slower than for-loops. Do not devectorize code to allow for parfor; in general, this solution does not work well. Loop iterations that take a short time to execute. In this case, parallel overhead dominates your calculation. You cannot use a parfor-loop when an iteration in your loop depends on the results of other iterations. Each iteration must be independent of all others. For help dealing with independent loops, see Ensure That parfor-Loop Iterations are Independent. The exception to this rule is to accumulate values in a loop using Reduction Variables. for-loops with a computationally demanding task. These loops are generally good candidates for conversion into a parfor-loop, because the time needed for computation dominates the time required for data transfer. for-loops with a simple computational task. These loops generally do not benefit from conversion into a parfor-loop, because the time needed for data transfer is significant compared with the time needed for computation. In this example, you start with a computationally demanding task inside a for-loop. The for-loops are slow, and you speed up the calculation using parfor-loops instead. parfor splits the execution of for-loop iterations over the workers in a parallel pool. This example calculates the spectral radius of a matrix and converts a for-loop into a parfor-loop. Find out how to measure the resulting speedup and how much data is transferred to and from the workers in the parallel pool. In the MATLAB Editor, enter the following for-loop. Add tic and toc to measure the computation time. In the script, replace the for-loop with a parfor-loop. Add ticBytes and tocBytes to measure how much data is transferred to and from the workers in the parallel pool. Run the new script on four workers, and run it again. Note that the first run is slower than the second run, because the parallel pool takes some time to start and make the code available to the workers. Note the data transfer and elapsed time for the second run. The parfor run on four workers is about three times faster than the corresponding for-loop calculation. The speed-up is smaller than the ideal speed-up of a factor of four on four workers. This is due to parallel overhead, including the time required to transfer data from the client to the workers and back. Use the ticBytes and tocBytes results to examine the amount of data transferred. Assume that the time required for data transfer is proportional to the size of the data. This approximation allows you to get an indication of the time required for data transfer, and to compare your parallel overhead with other parfor-loop iterations. In this example, the data transfer and parallel overhead are small in comparison with the next example. The current example has a low parallel overhead and benefits from conversion into a parfor-loop. Compare this example with the simple loop iteration in the next example, see Example of parfor With High Parallel Overhead. In this example, you write a loop to create a simple sine wave. Replacing the for-loop with a parfor-loop does not speed up your calculation. This loop does not have a lot of iterations, it does not take long to execute and you do not notice an increase in execution speed. This example has a high parallel overhead and does not benefit from conversion into a parfor-loop. Write a loop to create a sine wave. Use tic and toc to measure the time elapsed. Elapsed time is 0.012501 seconds. Replace the for-loop with a parfor-loop. Add ticBytes and tocBytes to measure how much data is transferred to and from the workers in the parallel pool. Run the script on four workers and run the code again. Note that the first run is slower than the second run, because the parallel pool takes some time to start and make the code available to the workers. Note the data transfer and elapsed time for the second run. Elapsed time is 0.743855 seconds. Note that the elapsed time is much smaller for the serial for-loop than for the parfor-loop on four workers. In this case, you do not benefit from turning your for-loop into a parfor-loop. The reason is that the transfer of data is much greater than in the previous example, see Example of parfor With Low Parallel Overhead. In the current example, the parallel overhead dominates the computing time. Therefore the sine wave iteration does not benefit from conversion into a parfor-loop.